SUMMARY: Although not useful for the evaluation of coiled aneurysms, CT angiography (CTA) is far superior to MR angiography (MRA) for the evaluation of aneurysms after surgical clipping. Using the latest multidetector row scanners and optimized imaging parameters, CTA can often effectively depict and follow small aneurysm remnants; demonstrate patency, stenosis, or vasospasm in the adjacent parent vessels; and provide surveillance of the entire cerebrovasculature for de novo aneurysms after surgical clipping. Despite these advances, conventional angiography remains the gold standard for the evaluation of surgically treated aneurysms and should be liberally used to resolve any cases of diagnostic uncertainty on noninvasive imaging. Vascular imaging plays an important role in the perioperative and postoperative evaluation of cerebral aneurysms that are treated by surgical clipping. In the intraoperative or immediate postoperative period, imaging is required to evaluate aneurysm residual and parent vessel compromise.1 In the setting of recent subarachnoid hemorrhage, imaging surveillance for cerebral vasospasm is also necessary. Although the risk for recurrence of a clipped aneurysm is low, there is evidence that aneurysm recurrence as well as de novo aneurysm formation with subsequent subarachnoid hemorrhage can occur even after successful surgical treatment.2–9 These data support the use of routine periodic imaging surveillance after successful surgical clipping. Although imaging after surgical aneurysm clipping has traditionally been achieved with conventional catheter-based angiography, CT angiography (CTA) may provide an acceptable alternative in many cases, particularly for long-term postoperative follow-up. CT imaging of the brain is routinely used for the perioperative assessment of patients treated with aneurysm clips to evaluate hemorrhage, infarction, hydrocephalus, and mass effect. MR imaging continues to be the technique of choice for the evaluation of subtle clinical abnormalities not explained by CT in patients with MR–compatible aneurysm clips.10 On the other hand, MR angiography (MRA) remains limited for the evaluation of aneurysms after surgical clipping due to the substantial artifacts created by the available surgical clips, which usually completely obscure the immediate perianeurysmal region.11 Although some adjustments in MRA parameters, such as short echo time, may reduce magnetic susceptibility artifacts, MRA is not of consistent utility in the evaluation of the perianeurysmal region following surgical clipping. A number of reports show that multidetector CTA is increasingly replacing catheter-based angiography for the preoperative diagnosis and surgical planning for patients with both ruptured and unruptured aneurysms.17–20 CTA is a fast, reliable, accessible, and relatively inexpensive technique that can be performed on acutely ill patients with minimal or no sedation and little associated risk. The latest generation of 16- to 64-section multidetector row CT scanners is capable of producing an image quality that approaches that of digital subtraction angiography (DSA) (Fig 1).13,18,19,21–27 These higher order multidetector row scanners allow increasingly faster scanning time and improvements in the section profile, which result in fewer artifacts. The rapid scanning times allow better timing to the “sweet spot” of the contrast bolus, resulting in optimal arterial phase vascular opacification and less associated venous contamination. A, 3D volume rendering of CTA data viewed from the anterior and to patient's left side demonstrates a straight and right-angle clip at the anterior communicating artery. B, The combination of this view and a projection viewed from the posterior and slightly to the patient's right side demonstrates patency of the anterior communicating artery and adjacent vessels, with no evidence of residual aneurysm. A view from above (C) and from the patient's right side (D) demonstrates an additional aneurysm (arrowhead) arising in the medial clinoid segment, also referred to as the “carotid cave” with growth of the dome directed posteriorly and inferiorly toward the sella. A frontal projection angiogram (E) shows the region of the clips (arrow), which are subtracted out on subtracted conventional angiography and also demonstrates the medially directed “cave” aneurysm (arrowhead). 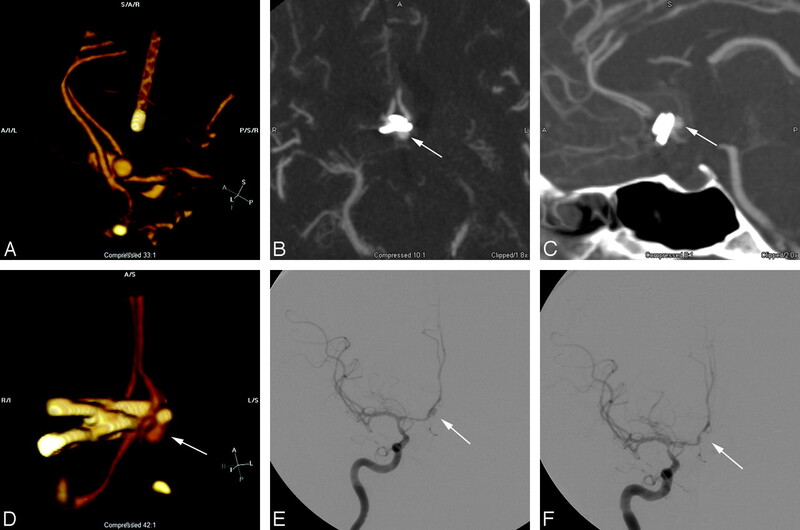 Although the initial intraoperative or immediate postoperative assessment of the clipped aneurysm remains within the domain of conventional angiography, later follow-up vascular imaging is increasingly being performed with CTA. The goals of these postclipping examinations in the perioperative period are to evaluate for aneurysm residual after clipping, parent vessel compromise and cerebral vasospasm. Occasionally these examinations are also warranted to investigate the etiology of an unexplained post-operative neurologic deterioration. In the late postoperative period, imaging is performed to assess the stability of the clipped aneurysm and any associated remnant and to survey the remaining vasculature for de novo aneurysms. Several small studies have confirmed the potential utility of CTA for the assessment of aneurysms after surgical clipping. van Loon et al15 first described the application of spiral CTA for the assessment of aneurysms after surgical clipping in a series of 11 patients with 13 aneurysms. These investigators noted that despite some artifacts from the surgical clip, an assessment of residual aneurysm filling and patency of the adjacent parent vessels was possible by using CTA (but not MRA). Dedashti et al16 reported on 49 patients with 60 clipped aneurysms who underwent both multisection CTA and DSA. When the CTA was deemed to be of “good quality” (84% of studies), the studies were 100% sensitive and specific for the detection of 2 small (<2 mm) residual aneurysms in this population of 42 patients. These authors also noted that CTA was time-efficient and cost-effective in comparison with DSA. Our experience would also be consistent and indicates that even small residual aneurysm remnants can be visualized with good-quality CTA (Fig 2). Sagara et al28 pointed out that CTA does have important shortcomings, particularly in those patients in whom multiple surgical clips are used for reconstruction or where cobalt alloy–containing clips are used. In these cases, extensive artifacts from the clip construct obscure the aneurysm and adjacent parent vessel, and noninvasive assessment is of limited utility. A, Axial source image through a surgical clip at the basilar tip demonstrates artifacts directed along the long axis of the clip as the result of the increased attenuation through that axis. B, The coronal multiplanar reconstruction image does not demonstrate many artifacts, despite the degradation of the axial source image, but the area immediately adjacent to the clip is not optimally imaged. C, With optimal threshold settings, in a 3D volume-rendered image viewed from the posterior and inferior aspect clips at the basilar tip, a small residual is evident (arrow), projecting off the left and posterior aspect of the aneurysm neck. Note that the orientation of this image is close to the projection for a Towne view routinely used for diagnostic evaluation of the posterior circulation, except that the CTA is being viewed from behind. D, Frontal “transfascial” view from catheter-based DSA demonstrates a double attenuation (arrow) that is suggestive of a residual aneurysm remnant. E, Towne view similar to the projection from the volume-rendered CTA, but now viewed from the front, demonstrates the small “dog ear” residual (arrow) on the left, measuring approximately 2 mm. Principal scanning-parameter adjustments that allow improved resolution of the area surrounding aneurysm clips include section profile (including both thickness and pitch), photon attenuation, and photon energy (Table). Given the small diameter of the intracranial vasculature, one should use maximal z-plane (intersection) resolution. For most manufacturers, this is in the submillimeter range of 0.625 mm, which indicates that in the worst case scenario of an in-plane vessel, at least 2 sections will represent a 1-mm vessel. Because CTA scanning is a volumetric acquisition, these 2 theoretic sections are not equivalent to the older technology nonhelical axial acquisition technique of scanning but rather simply indicate a level of certainty that a 1-mm intracranial vessel will be seen—at worst—on at least 2 distinct source images during review on the PACS system. The importance of this principle is later elucidated when the ideal methods of CTA interpretation are discussed. In addition to thin-section imaging, one may reduce the scanning pitch, resulting in oversampling and increased photon attenuation. Optimal scanning pitch to minimize clip-related artifacts is approximately 0.6 mm, with increasing pitch beyond this resulting in increased clip-related artifacts and more shallow pitch below this level showing little visible difference in artifacts.29 Therefore, the resultant increase in radiation dose to the patient for a pitch below 0.6 appears to have no significant benefit. A higher photon-energy setting of 140 kilovolt (peak) (kV) compared with most CTAs performed by using 120 kV(p) results in fewer artifacts from the clip and correlates with increased penetration of the clip by the x-ray photons. The drawback associated with overpenetration at higher kilovolt (peak) is that it may cause a reduction in contrast resolution of the iodinated contrast-filled vessel next to the clip. One option is to enhance vascular contrast visibility by increasing the iodine contrast attenuation to approximately 350- to 400-mg iodine per milliliter.29 A review of 25 patients using a 140-kV(p) and 350-mg iodine per milliliter contrast technique at our institution (unpublished observations; R.C.W., 2006) did not demonstrate a significant improvement in the ability to evaluate the region surrounding the clipped aneurysm. In these patients, the most important factors were achieving optimal timing of the contrast bolus as well as the volume and composition of metal clips used. Clip composition has a significant effect on CT imaging after surgical treatment. 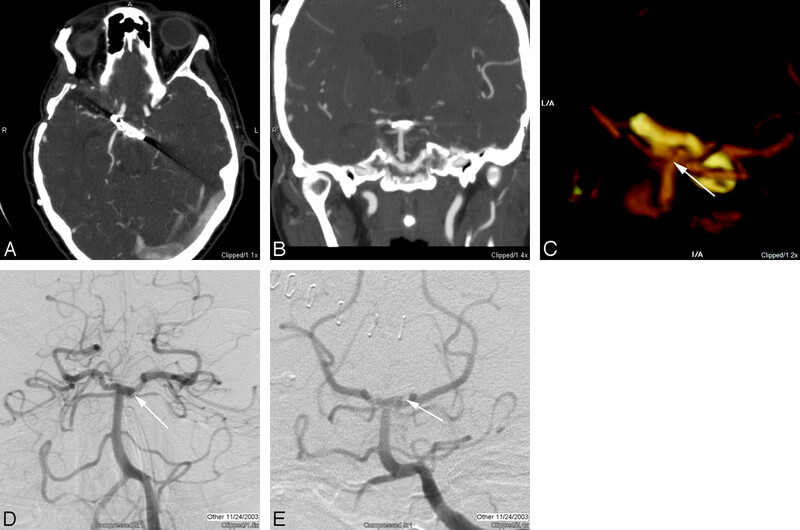 van der Schaaf et al30 screened 415 patients with ruptured intracranial aneurysms that had been treated with cobalt clips to assess the feasibility of CTA in evaluating this patient population. 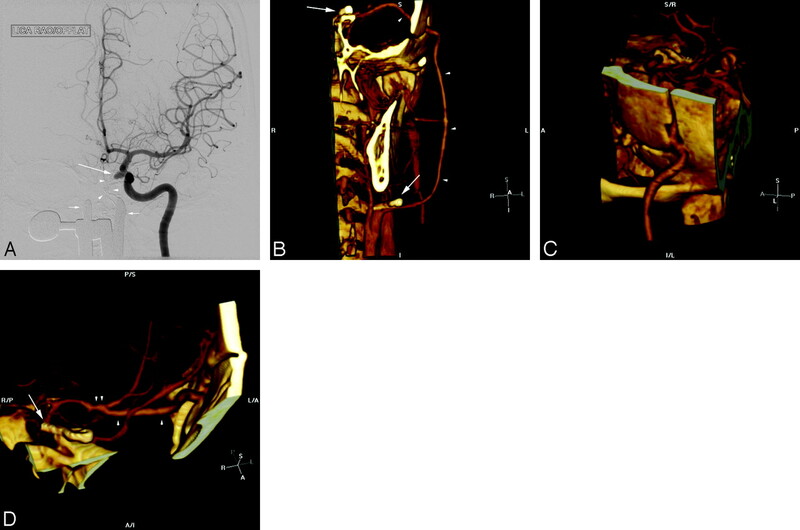 Although CTA was feasible for the evaluation of the cerebrovasculature remote to the clip site, artifacts in the region of the surgical clip precluded evaluation in the region of the parent vessel–aneurysm complex. The authors suggested that the poor visibility in the periclip region could be resolved to some extent by the use of titanium clips. Cobalt clips produce significantly more artifacts than titanium clips on CTA. At many institutions, cobalt clips have been replaced by titanium clips (Fig 3). Clip position relative to the area of interest also seems to have an effect. Perpendicular clip placement relative to the parent vessel results in fewer artifacts. Moreover, if a clip lies oblique to the scanning plane, there appear to be fewer artifacts. Conversely, when a large portion of a surgical clip lies in-plane to the detector array, parent vessel visibility is negatively impacted. Although head position theoretically could be changed to improve the orientation and throw off the artifacts from other areas of interest, changing the head position is not practical in clinical practice. In addition to requiring custom head positioning at the time of scanning, the resultant oblique orientation of the head may not be optimal for evaluation for the remainder of the brain and intracranial circulation. A, Axial source image at the level of 2 cobalt clips demonstrates significant artifacts that obscure the surrounding brain and vessels. Wider windows were used to minimize artifacts but resulted in poor vessel contrast differentiation. B, Axial source image through a series of 3 titanium aneurysm clips, with a fourth clip partially imaged, demonstrates minimal artifacts related to the titanium, and the parent vessel can easily be seen (arrow) with no evidence of residual aneurysm. C, 3D volume rendering demonstrates the 4 titanium clips and adjacent vessels without significant degradation by artifacts. D, Catheter angiogram demonstrates the original aneurysm before clip reconstruction. All examinations are reviewed with attention to axial source images, coronal and sagittal multiplanar reformats, as well as interactive 3D volume rendering to evaluate the aneurysm that has been treated as well as the remainder of the cerebral circulation. Occasionally, multiplanar reformatted images are necessary to interrogate the clip site, but in most cases, 3D volume rendering provides the most useful information (Fig 4). Unlike with MRA, maximum intensity projection reconstructions of CTA source images are generally less useful. A detailed evaluation of the axial source images is necessary to determine possible sources of error. For example, vascular calcification represents a relatively frequent pitfall in the interpretation of CTA. When the attenuation of calcification in an atherosclerotic plaque is similar to that of the intraluminal contrast bolus, it may simulate an aneurysm. The source images remain the reference point to clarify these potential sources of error; thus, the importance of submillimeter scanning emerges. If one considers that most aneurysms occur within the circle of Willis at points where the vasculature is a millimeter or greater, submillimeter scanning reduces errors introduced by volume averaging by providing the opportunity for an abnormality and its parent vessel to be seen on more than 1 source image, thereby helping the observer better determine the nature of the pathology. 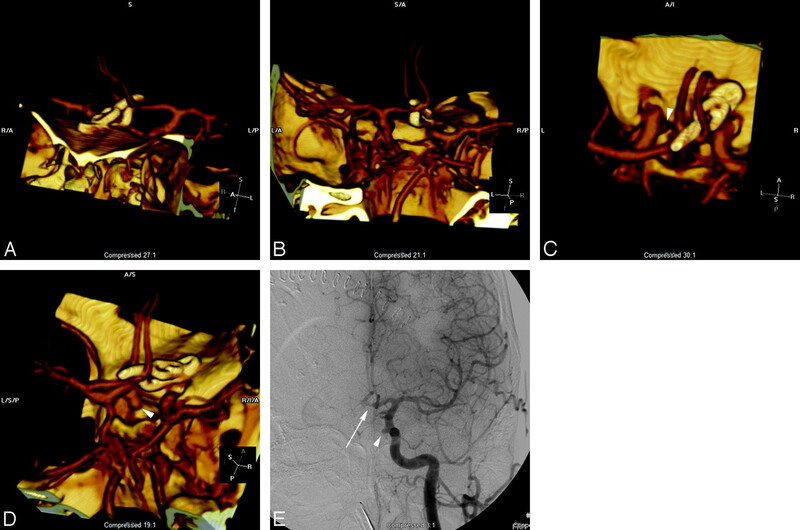 A, 3D volume reformat of CTA demonstrates a bilobed anterior communicating aneurysm. B, Axial MPR image obtained in the perioperative period demonstrates a round contrast collection consistent with a residual aneurysm remnant (arrow) of the posterior lobe of the bilobed aneurysm. C, Sagittal reformat also demonstrates a similar finding (arrow) and better shows the relation to the aneurysm clips. D, 3D volume rendering of the same CTA data, viewed from the anterior and below, gives an easily identifiable angiographic appearance that shows the residual aneurysm remnant (arrow) and the relation to the parent vessel and clips. E, Follow-up angiogram of the right internal carotid artery obtained 1 week post-subarachnoid hemorrhage demonstrates the residual aneurysm lumen (arrow) as well as a vasospasm involving the supraclinoid internal carotid artery and A1 segment. F, After coil embolization of the aneurysm remnant (arrow), the angiogram shows no residual aneurysm. The anterior communicating artery, middle cerebral bifurcation, and posterior circulation aneurysms are usually not in direct contact with adjacent bone and are more readily evaluated with CTA after clipping (Fig 1). Segments of the cerebral circulation encased within or located adjacent to osseous structures (eg, near the skull base or the clinoid processes) present the most difficulty with respect to postoperative imaging and image interpretation. Obscuration of these structures by the adjacent attenuated interface is further compounded with the addition of a surgical aneurysm clip. Some authors have attempted to solve this difficulty by using CTA subtraction techniques.31–34 Although subtraction CTA techniques continue to evolve, significant limitations persist. Unlike DSA in which 2D images are subtracted from one another, digital subtraction CTA essentially requires a 3D volume subtraction. The slightest patient movement when considered within the context of the submillimeter resolution achieved with a 64-channel acquisition hints at the preciseness with which two 3D volumes must match to gracefully subtract. Nevertheless, with continued advancements in computing horsepower enabling nonlinear nonfeducial volume translations, it is likely that digital subtraction CTA may represent the next quantum leap in noninvasive neurovascular imaging. Improved techniques will substantially ameliorate the visibility of vessels located adjacent to very attenuated structures. The implications for the postoperative imaging of clipped aneurysms are obvious. As with endovascular coiling, the goal of surgical clipping is the elimination of the aneurysm from the cerebral circulation. In many cases, a clip across the neck of the aneurysm is all that is needed. More complex aneurysms may require multiple clips to effectively close off a wide-necked aneurysm or to reconstruct the lumen of the parent vessel if it is incorporated into the aneurysm wall. Although the use of multiple clips may cause more artifacts because of the bulk of the metal attenuation, a titanium clip construct significantly improves this problem (Fig 3). In other cases, the parent vessel may need to be sacrificed with revascularization by means such as a bypass procedure to prevent ischemia in the distal territory. In such cases, CTA of the neck should be tailored to cover the entire course of the bypass to evaluate patency (Fig 5). A, Frontal projection radiograph of a patient sent to our institution for treatment of a pseudoaneurysm (arrow) in the cavernous segment of the left internal carotid artery resulting from transsphenoidal surgery. Packing material (arrowheads) and a speculum (small arrows) were left in place from surgery. 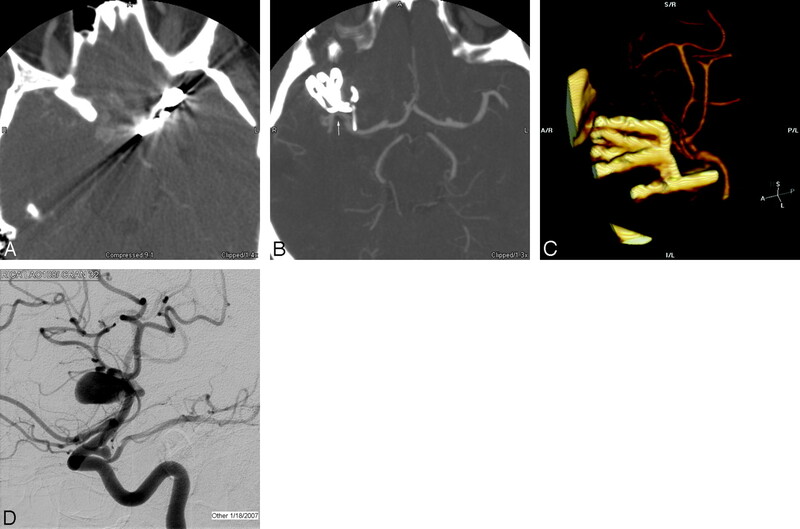 B, Postoperative CTA with 3D volume rendering demonstrates a clip occluding the proximal left internal carotid artery (arrow). A patent radial artery bypass (arrowheads) has a proximal anastomosis site to the left internal carotid artery just proximal to the clip. C, A second view demonstrates that the bypass is patent through the craniotomy site. D, Intracranial view shows the distal clip (arrow) effectively trapping the cavernous carotid pseudoaneurysm. The bypass (single arrowheads) is intact through the intracranial course, and the distal anastomosis (double arrowheads) to the middle cerebral artery is intact. CTA, though not useful for the evaluation of coiled aneurysms, is far superior to MRA for the evaluation of aneurysms after surgical clipping. Using the latest multidetector row scanners and optimized imaging parameters, CTA can often effectively depict and follow small aneurysm remnants; demonstrate patency, stenosis, or vasospasm in the adjacent parent vessels; and provide surveillance of the entire cerebrovasculature for de novo aneurysms after surgical clipping. Despite these advances, conventional angiography remains the gold standard for the evaluation of surgically treated aneurysms and should be liberally used to resolve any diagnostic uncertainty on noninvasive imaging.